My partner gave me a book voucher for Mother's Day and I finally got around to using it today.I'm so excited as I've been wanting this book for a while. I might even have to go to bed early so that I can start reading it! 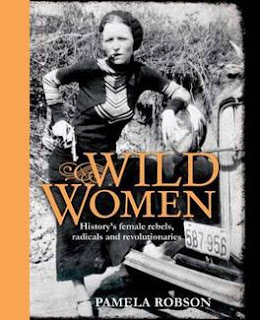 Wild Women details the lives and deeds of some of the most extraordinary women in history. Trailblazers, hell-raisers and firebrands, these women showed a level of daring and disregard for traditional gender roles completely atypical of their time and culture. This collection features women like Njinga, guerrilla fighter and queen of seventeenth century Angola; Moll Cutpurse, underworld matriarch of the streets of Elizabethan London; Irish pirate and rebel Anne Bonny; and infamous American bank robber, poet and songwriter Bonnie Parker. Whether fighting for their country, political beliefs, or for personal gain, whether loners or leaders, these women were prepared to push through and beyond society's boundaries to achieve their ends.